Wikipedia list of bridge failures features 110 entries from year 2000 onwards, including several high-profile ones like the Genoa viaduct disaster. The recent accident again prompts the question: how could it happen in 21st century with the present bridge structural monitoring abilities of the industry? Bridge building has been evolving for thousands of years, with the oldest parts of bridges ever found dating back to 1500 yearc BC. Even the first iron bridge has been built centuries ago, in 1779. Hence the vast majority of bridges are built by the book with reliable well-tested methods. It is what we like to call a mature technology. Yet bridges do fail. In a way a bridge failure can be compared to a plane crash. Bridges in general are considered safe, only a very small percentage of bridges actually fail. But when an accident occurs it has catastrophic immediate consequences and tops the news. The difference, though, is that there are hundreds of sensors on each jet plane monitoring its health all the time, while the most common method for evaluating the health of a bridge is - visual inspection. In today’s data-driven world the monitoring of bridge structural health is far from data-driven. And so is their overall maintenance. A great simulation of the Morandi bridge collapse in Genoa. Video shows one of the cables embedded in concrete snapping and initiating the collapse. Inspection of the steel cables inside concrete was difficult due to visual obstruction. Even so, the inspection reports warned the autorities and some of the other cables have been replaced in the past. As mature as the technology might seem, building anything that needs to last 100 years is a huge engineering challenge. Most of the bridge collapses occur well into their life and the inspection reports from the years before the collapse normally contain warnings about the deficient structural state . The same was the case with the Morandi Bridge in Genoa and I-35W Mississipi River Bridge in Mineappolis in 2007. The problem is that there are nowhere near enough resources (financial, operational and infrastructural) to replace or repair all the bridges that are deemed structurally deficient in those reports. Therefore the bridge owners (states, ultimately) are faced with priority decisions. 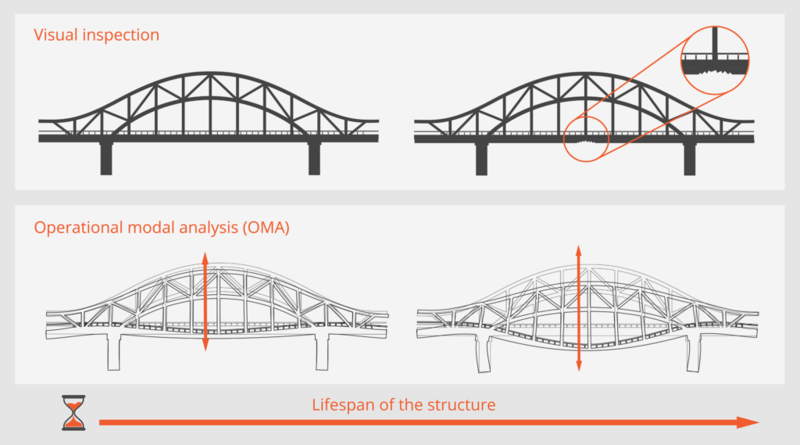 And since there is not enough real data on the structural behaviour of bridges during their life, they don’t have a database upon which to decide. The excuse for not monitoring every bridge with a sophisticated data acquisition system based on vibration and strain sensors has long been the price of such installations. Recent developments in measurement hardware, data analysis software and structural engineering methods have decreased that cost dramatically. It is now possible to monitor the structure with relatively affordable 3-axial accelerometers. Devices are only linked with a single network cable extending from sensor to sensor over large distances. MonoDAQ-E-gMeter utilizing low-noise MEMS ADXL35x-series accelerometers from Analog Devices is a revolutionary technology. It dramatically decreases the cost of structural monitoring and helps the bridge safety institutes to gather vibration data continuously and in real-time from remote locations. Continuous bridge structural monitoring with 3-axial accelerometers allows engineers to perform operational modal analysis that is much more quantitative than visual inspection. The sensor network monitors the vibrations accross the structure, allowing engineers to perform the operational modal analysis (OMA). Measured acceleration data is integrated into velocities and displacements and analyzed in frequency domain. The result are oscillation shapes (modes) of the structure. Keep in mind that a bridge oscillates under excitation just like a guitar string, albeit with a rather low amplitude compared to its size. A very sensitive accelerometer is able to detect that and a data acquisition software package like DEWESoft is able to translate the data into meaningful parameters. This way the bridge vibration monitoring is running continuously. For example, a decrease in stiffness due to steel corrosion changes the frequency and amplitude of the vibration. The same is true when excessive load is applied to the bridge due to increased traffic or wind. That is not to say that it is straightforward to determine when the bridge is in a critical state and needs to be stopped for traffic. But at least we should start gathering the long-term data from as many installations as possible to build databases that are fundamental for deciding on maintenance priorities. Constant synchronized state-wide vibration measurement and operational modal analysis combined with weather and traffic monitoring will enable us to improve on the bridge health criteria over time. Gathered information will give us unparalleled insights in prioritising bridge repairs, saving state expenditures and most importantly, human lives. MonoDAQ-E-gMeter bridge structural monitoring system makes the engineering surveillance possible for the price that is negligible compared to structural repairs or worse, to the bridge collapsing. Learn more on continuous structural monitoring of bridges using low-noise triaxial MEMS accelerometers.